I’m delighted to welcome Dr. Masashi Yoshimura to our lab as a Staff Scientist. Yoshi is originally from Japan, but most recenlty comes to us from the California Academy of Sciences where he was a member of Brian Fisher’s lab for 5 years. 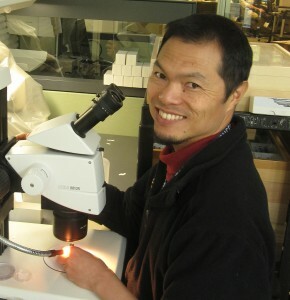 Yoshi is one of the very few biologists in the world who studies ant male morphology. The vast majority of attention on the Ecology, Evolution, and taxonomy of ants focuses on the worker caste. He will be working on the Fijian male fauna, the broader evolution of ant males, and other biodiversity projects related to the Japanese fauna.